Vietnam has launched a new operation to fight what the government has called "wrong" views on the Internet. The new cyber combat operation, Force 47, has 10,000 members. It is part of the government’s growing effort to end criticism against the state. Lieutenant General Nguyen Trong Nghia is one of the heads of the military's political department. At a Monday conference of the Central Propaganda Department, he said the operation is already at work in several areas of the government. "In every hour, minute and second, we must be ready to fight proactively against the wrong views," he said. Communist-ruled Vietnam has increased attempts to control the Internet. The government intends to watch social media more closely and remove material it believes is offensive. In August, Vietnam's president said the country needed to pay greater attention to controlling news websites and blogs with “bad and dangerous” material. Last month, a blogger was sent to jail for seven years for spreading “propaganda against the state.” The blogger had written about a massive chemical waste spill made by Formosa, a Taiwanese-owned factory in Vietnam. 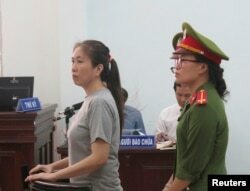 The court also rejected an appeal from Mẹ Nấm, or Mother Mushroom, who is serving a 10-year jail sentence on anti-state propaganda. Mẹ Nấm had posted articles on Facebook critical of the government on human rights and civilian deaths in police custody. FILE - Prominent blogger Nguyen Ngoc Nhu Quynh, also known as Mẹ Nấm, or Mother Mushroom, stands trial in Vietnam, June 29, 2017. She was accused of distorting government policies and defaming the Communist regime on her Facebook posts. Vietnam is one of the top 10 countries for Facebook users. The government has written an Internet security bill asking for local placement of Facebook and Google servers. But the bill has been the subject of fierce debate at the National Assembly and is still awaiting its approval. Its neighboring country, China, allows only local Internet companies that operate under restricted rules. Cybersecurity firm FireEye Inc. said Vietnam had developed strong internet spying abilities in an area of the world with weak defenses. A representative of FireEye told Reuters news agency that Vietnam is not the only nation using these abilities. He said the growing use among nations will impact governments, journalists, activists and even international companies. He said that cyber spying is becoming more attractive to nations partly because it provides them with a lot of information while the costs are modest and risks are low. Alice Bryant adapted this story for Learning English based on Reuters news reports. Hai Do was the editor.